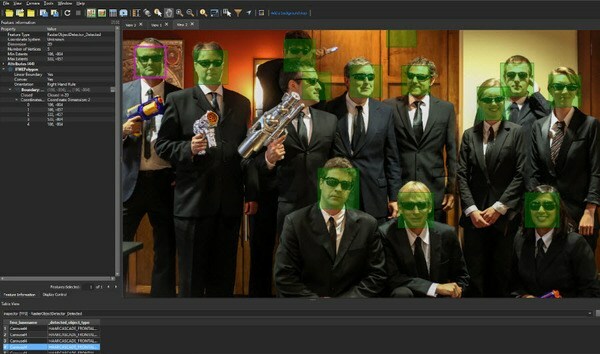 Get ready for the fastest, darkest, and most mind-blowing version of FME you’ve ever seen! Read on to see why FME 2019 has got everyone so excited. 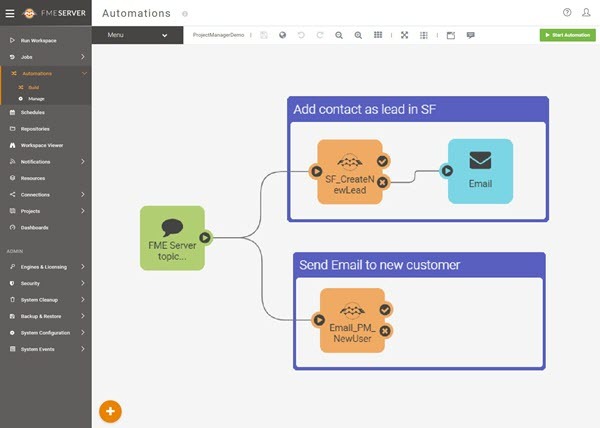 Stay on top of all your data integration workflows! Don’t just inspect your data - experience it! Transform and convert your data into a .udatasmith file and watch it in action. Why use a gaming engine? The icon indicates features which were suggested by FME users. Click on the icon to see the original post. With a new native Revit reader, you can read your Revit files directly without needing to use RVZ intermediate files. Read DICOM (Digital Imaging and Communications in Medicine) files and learn more about the medical imagery it holds along with additional metadata. 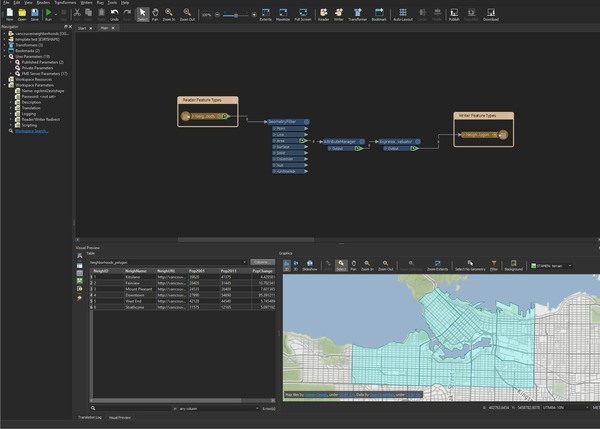 Use FME to create Esri’s Indexed 3D Scene Layer format from your collection of 3D models, point clouds, shapefiles, and other data. The Microstation Design (V8) reader now supports reading DGN mesh elements directly so you can work with both 2D and 3D features in FME. Now you can both read and write .fmear files in FME. 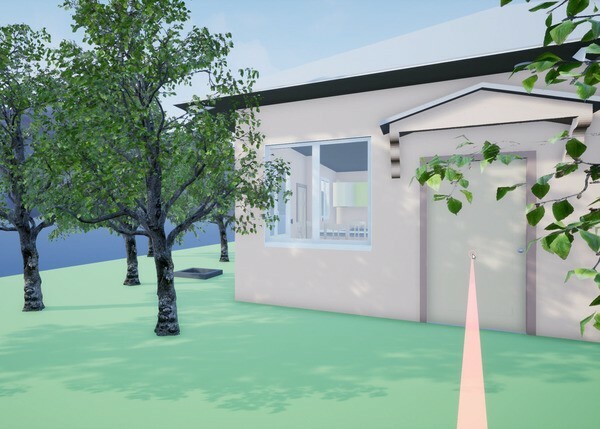 Create, edit, and then view your models in augmented reality. Sets of transformers, readers/writers, and web connectors are now being distributed as FME Packages (.fpkg). Packages will allow for continuous deployment of component upgrades outside of an FME release. The Amazon S3 Connector contains the S3Connector transformers as well as the Amazon S3 web file system that allows readers to access S3 directly. The Azure Storage Connector contains both the AzureBlobStorageConnector and AzureFileStorageConnector to connect to the web service. These new transformers can be used to support efforts in computer vision and machine learning. Alongside the RasterObjectDetector is the Raster Object Detection Trainer package which contains three additional transformers. 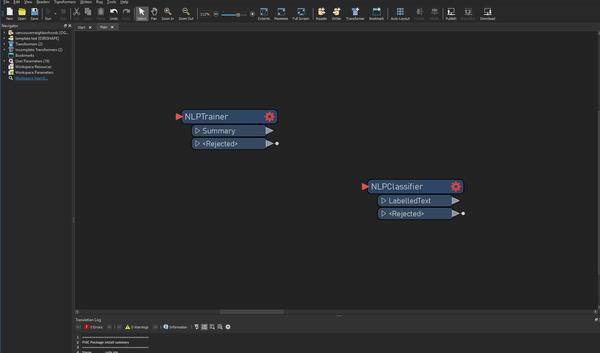 This new FME package contains two transformers: the NLPTrainer and the NLPClassifier. Use these transformers to make interpreting large amounts of natural language data a breeze. What a difference! The Dissolver has experienced some serious performance improvements and now runs up to 75x faster (depending on input data). Observe the exact changes that have been made between your original and revised datasets in the new “Updated” output port. 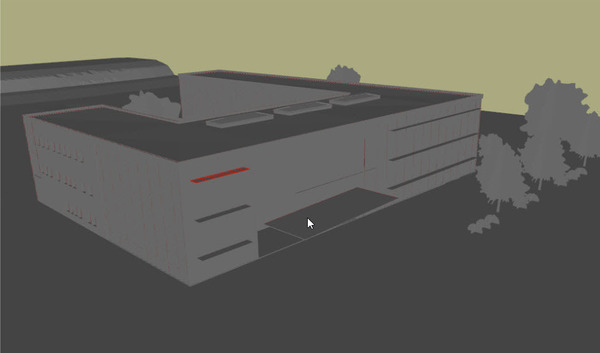 A new “Approximate Center Line” mode has been added. It uses Delaunay triangulation to perform the calculation. No longer based on ArcObjects and does not need ArcGIS installed on your computer to use. 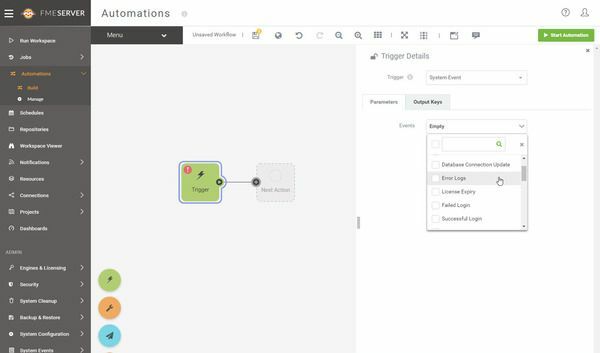 Use System Event triggers in Automations to track the health and status of FME Server. These events include actions relating to security, system information, Server status, and other Server activities. Create multiple tokens with specific parameters to allow anyone to access any FME Server processes you choose. 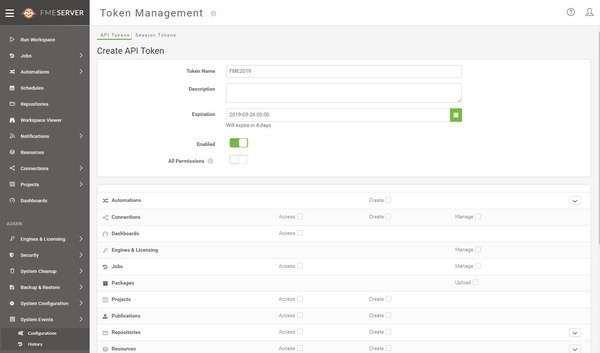 Generate as many tokens as you want with different permissions and expiration dates. Share FME Server URL pages to allow others to fill in forms or submit data. There's no need to create and maintain additional web pages to collect data. In addition to being able to filter completed Jobs based on engine, repository, or workspace, you can now also filter Jobs by warnings and errors. Create and now share your Projects on FME Hub directly to make it easy to migrate Project details between various FME Servers. New password policy management that allows the FME Server administrator to define the complexity of passwords set by additional FME Server users. Read your compressed data files directly in FME without having to decompress them first. Another barrier has been taken down! Sort FME Hub items by the official Safe Software account or by the community. Additionally, sign up to receive updates on what Safe Software has published. FME Server can now be deployed across a Kubernetes Cluster. Perfect for deployments that are on the cloud or on-premise. Run workspaces from your mobile device using the FME Data Express mobile application. Perfect for both technical and non-technical users.